Recipe by Mike Le from IamaFoodBlog - recipe can be found here. Place the shallot, garlic, and sugar in a mortar and pestle. Pound until everything becomes a homogenous, sticky paste. Really take your time with this, you want all of the oils in the shallots and garlic to be expressed. When everything is a paste, stir in the fish sauce, starting with 1 tablespoon, adding to taste up to 2 tablespoons. Stir in a ton of freshly ground black pepper. Adjusting if needed. The paste should taste sweet, salty, with a huge hit of slightly spicy shallot and garlic. Rub the marinade all over the ribs, then wrap tightly in foil, ribs curving up. Place the foil-wrapped ribs on rimmed baking sheets and bake for 6 hours, or until very tender and meat falls off the bone easily. Carefully open the foil and remove the ribs. There will be quite a bit of liquid/fat from cooking. Use a fine mesh sieve to strain. Set in the fridge so that the fat separates from the beef juices. Let the ribs cool slightly, then, using a knife, trim the meat away from the bones, neatly. 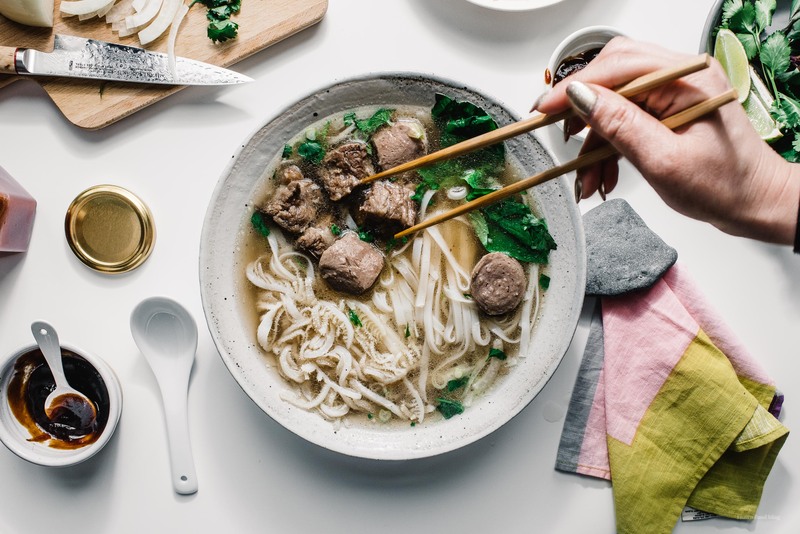 Cut the rib meat into cubes, cool, and keep in the fridge, covered, until you are ready to prepare the bowls of pho. Take the bones and place them in a rimmed baking sheet. Bake for another 1 hour, at 200°F. The bones should be nicely browned. When the bones have 10 minutes or so left, char your aromatics. Place the onion, shallot, ginger, cinnamon stick, cloves, coriander seeds, and star anise on a rimmed baking sheet and blow torch until fragrant. Alternately, char the onions, shallot, and ginger on an outdoor grill, over a gas range, or in an oven broiler and toast the coriander seeds, cloves, and star anise in a dry pan on low heat until they are aromatic, about 2-3 minutes. Tie the spices up in cheesecloth or large tea/spice bag for easy removal from your soup. Place the browned bones, along with the onion, shallot, ginger, seasoning packet, and sugar in a large dutch oven (5.5 quarts). Top with water, about 3.5-4 quarts. Bring to a boil over medium high heat, then lower to a simmer. Simmer, covered, for 3-4 hours. Remove the aromatics and bones and strain if desired. Grab the beef juice/fat that you saved in the fridge, discard the fat, and add the meat juice into the stock. Taste and season with fish sauce, 1 tablespoon at a time, until it’s slightly aggressive and just about over seasoned. Gently heat up the rib meat (and beef balls and omasum, if using) in the broth. The stock should be very hot. Prepare the noodles according to the package, strain and divide evenly into large, deep bowls. Add a generous amount of beef rib cubes (meatballs and omasum) Top with a generous amount of broth. Serve with a plate of bean sprouts, limes, Thai basil, rough chopped onion and cilantro and chilis. Have small dipping plates of sriracha and hoisin sauces for each person. Enjoy hot. Subscribe for Lone Mountain blog & recipe updates. © 2019 Lone Mountain Wagyu. All prices in USD. Juicy recipes. Tasty deals. A mouth-watering 10% off your first order. All for getting on our mailing list.